On Friday 13th September 2013 7827 steamed for the first time on the Ashburton branch. 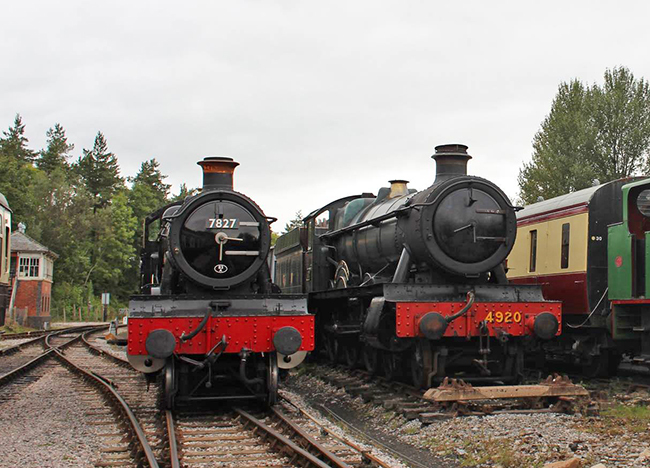 The pictures above shew Nick Perring on the footplate and 7827 beside our 4-6-0 4920 “Dumbleton Hall”. 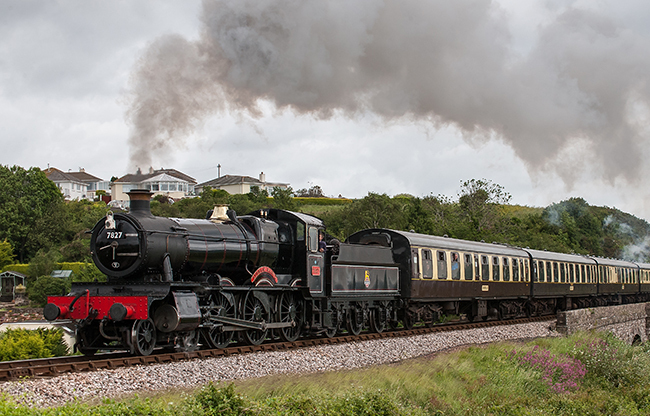 The South Devon Railway (SDR) is delighted to announce that former British Railways Western Region 4-6-0 7827 Lydham Manor will be making a very special guest appearance at the Heritage Transport Gala and Behind the Scenes weekend on September 14th & 15th. Based on the Dartmouth Steam Railway (DSR), apart from a brief visit to Didcot Railway Centre in 2010 Lydham Manor has only ever operated between Paignton and Kingswear, however the visit to the SDR will not be the first time that the locomotive has visited Buckfastleigh. 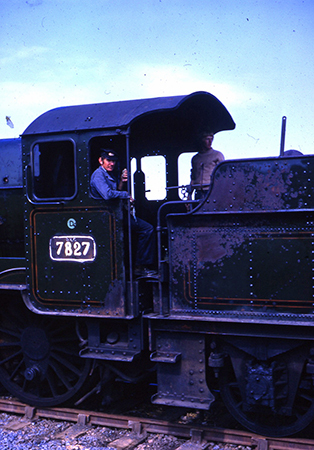 After becoming the fifth locomotive to be rescued from the famous Barry scrapyard in South Wales, 7827 first moved, by rail, to Ashburton for restoration in June 1970. Initial work took place inside the former engine shed before 7827 moved again, this time to the former works at Newton Abbot. 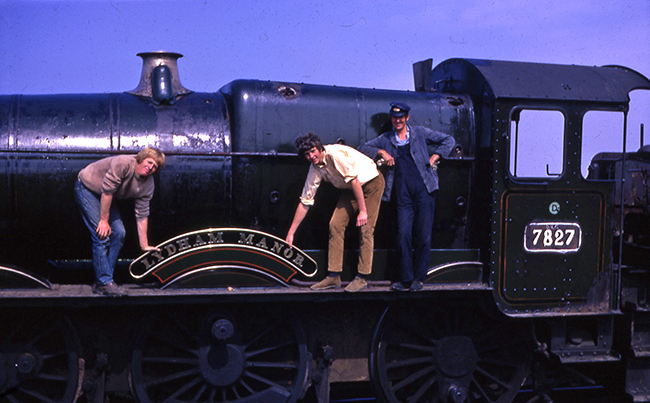 The locomotive steamed for the first time on March 16th 1973 and then worked under its own power to Paignton on March 30th where it operated for the next five years. 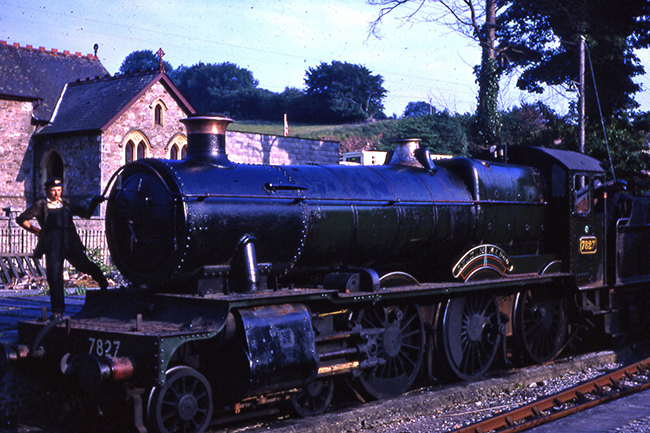 At the end of the 1978 season 7827 returned to the Ashburton branch for overhaul inside the main workshop at Buckfastleigh. Following completion of the work 7827 returned to Paignton again where it ran very successfully until August 1993, its final working being a double-headed trip with 4920 Dumbleton Hall. 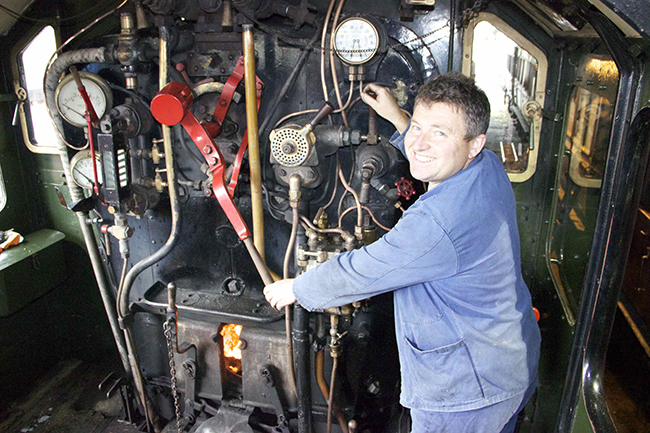 Another major overhaul was completed, this time at the DSR workshop at Churston, with a return to steam in July 2005. From its first steaming in 1973 until June 2011, although built by British Railways in 1950, Lydham Manor only ever appeared in an unauthentic Great Western lined green livery. The only exception to this was a very brief two day appearance in British Railways lined green in early 1986 when the locomotive was adapted as part of a filming contract. In June 2011 the DSR repainted 7827 into fully lined British Railways black livery as it would have been when first completed at Swindon works. During its visit to the SDR 7827 will take centre stage and will be used to haul a variety of trains, including operating with the carmine and cream liveried former Great Western coaching stock. The chance will also be taken to ensure the locomotive also operates on freight, Milk and possibly Parcels trains too. A highlight of the gala, which will feature an intensive train service and also sees the SDR open up many areas not normally accessible by the public as part of its annual behind the scenes event, will be the pairing of 7827 with SDR based 2251 class 0-6-0 “Collett Goods” 3205. 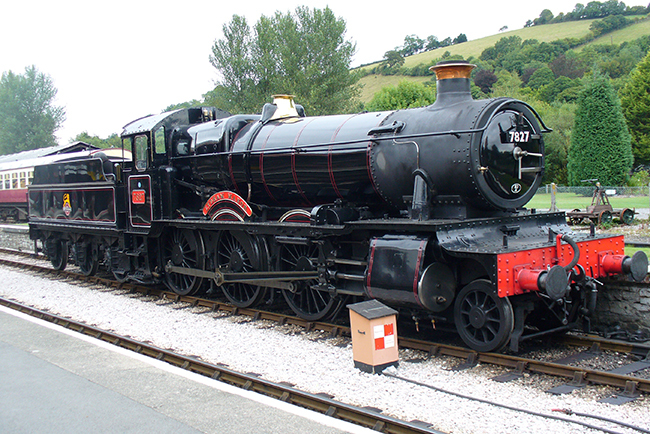 7827 will be delivered to Buckfastleigh facing smokebox to Totnes, the same way as 3205, and if needs be will be turned on the DSR turntable at Churston prior to its road move to Buckfastleigh. The combination of both locomotives running together will evoke memories of the Cambrian Coast route and two round trips are planned for the Saturday evening, one with 3205 leading 7827, then the other with 7827 leading 3205. “The appearance of 7827 at our Heritage Transport Gala will provide enthusiasts with the very rare chance to see the locomotive working away from its home line and we are extremely grateful to our friends on the Dartmouth Steam Railway for allowing us to have the locomotive” said event co-ordinator Andy Matthews. Following the gala 7827 has been booked by Don Bishop of Steam Recreations to operate a number of photo charters before it leaves the railway before the end of September. Other locomotives expected to appear during the Heritage Transport Gala include recently restored 0-6-0pt L92 which has proved very popular after being completed in London Transport livery following its recent overhaul. Diesel traction will be represented by the Devon Diesel Society's Class 37 6737 which will be making its last runs in “weathered” green livery prior to being stopped for extended maintenance this coming winter during which it will receive body repairs and a full repaint. 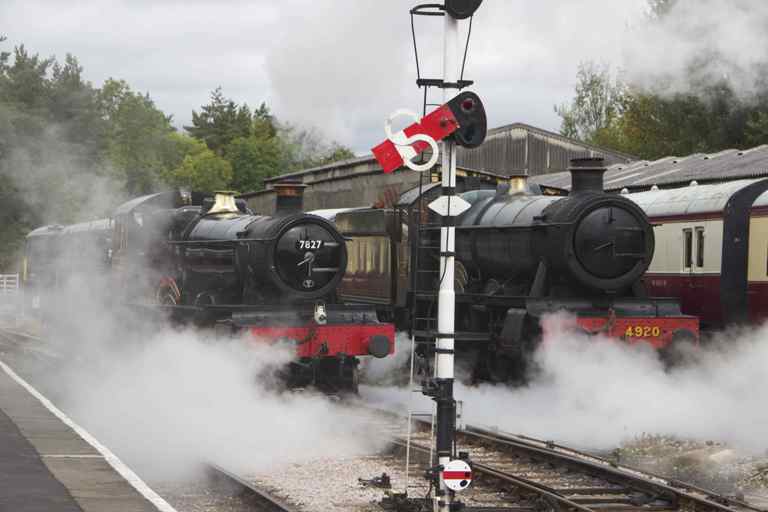 Coinciding with the National Heritage Open Days event, visitors to the Heritage Transport Gala will be able to visit many areas not usually open to the public. At Buckfastleigh there will be guided tours taking in the main workshops, the original signalbox at Buckfastleigh will be open for public viewing, whilst at Staverton the station yard will house an impressive display of rolling stock and plant and machinery used to maintain the railway. The first public trains will depart from Buckfastleigh at 09.30 each day (10.12 from Totnes) with a frequent 40 minute interval service operating thereafter. Additional passenger trains will run on Saturday evening, whilst on both days there will also be a number of freight and light engine movements prior to the first passenger train. The Devon Diesel Society on train bar will be in operation and it is also hoped to produce a special limited edition bottled ale to mark the visit of 7827. 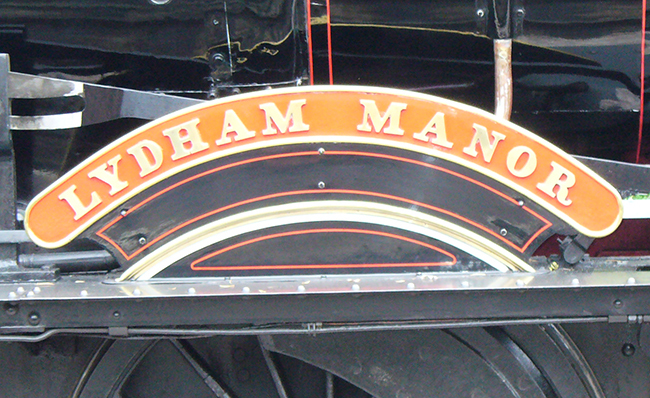 In addition to the above attractions, the museum at Buckfastleigh will be open as usual which includes a variety of interesting exhibits, including Tiny, the only surviving broad gauge locomotive, which is on loan from the National Railway Museum at York, together with a display of plans for the exciting future development of the Buckfastleigh site.